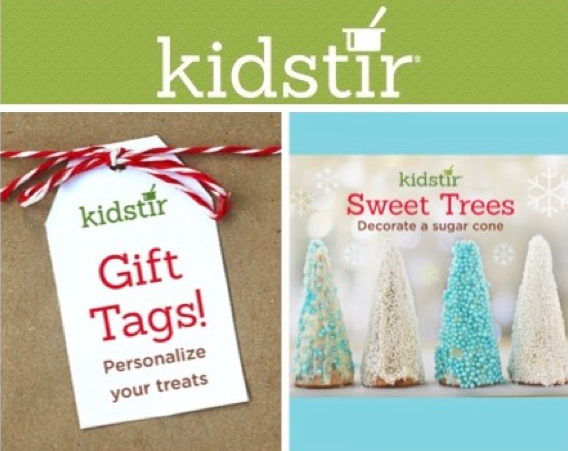 After you bake up your holiday treats, personalize them with these festive treat tags. Just print and fill them out, then wrap them around a box of homemade goodies. Happy holidays! And don’t forget, if a Kidstir subscription is going to be your kitchen gift, order by Sunday, December 11 (THIS WEEKEND!) to make sure the first kit arrives before Christmas! Don’t have time to decorate a whole gingerbread house? Your kids can do this with your guidance in just 15 minutes with just a plate and a butter knife. All you need is a little frosting, sugar cones, and sprinkles. Your kitchen will turn into a sweet winter wonderland! Here are the easy-peasy directions and recipe. Evenly spread frosting over ice cream cones to cover them. Pour sprinkles onto a plate and roll the cones until covered in sprinkles – or sprinkle them onto the frosted cones right out of the container. 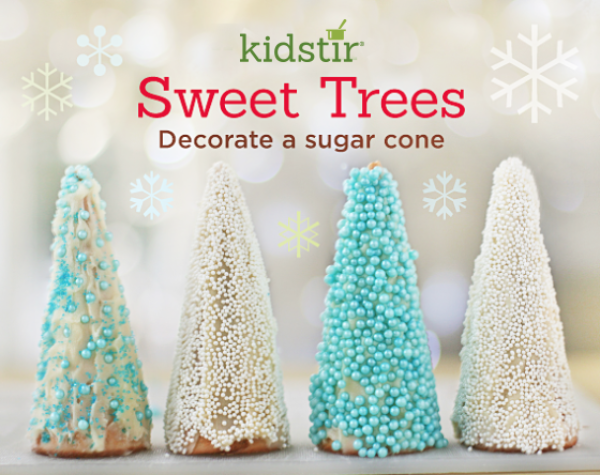 Display your kids tree treats as part of holiday decorations or eat them for a yummy dessert. Kidstir fans, thank you so much for an amazing year! As our gift to you, we’ve partnered with Back to the Roots for an extra-special giveaway, valued at more than $170! To enter to win, just hop over to our FB page and tell us one thing your child has learned in the kitchen this year. Enter before December 11 to win this amazing prize! 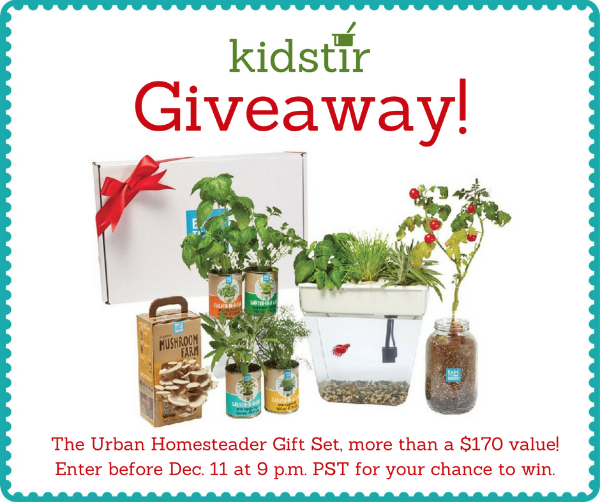 The Urban Homesteader Gift Set is packed with goodies to inspire and delight your little chefs and foodies!